How to configure the Ranger KMS Server for SSL, when setting up Ambari Ranger SSL using Public CA certificates. Stop Ranger KMS by selecting Service Actions > Stop. 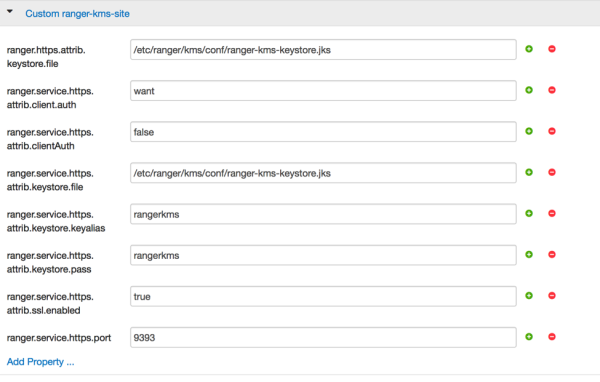 Under Advanced kms_env, update the value of kms_port to match the value of ranger.service.https.port. Save your changes and restart Ranger KMS. When you attempt to access the Ranger KMS UI with the HTTPS protocol on the port specified by the ranger.service.https.port property, the browser should report that it does not trust the site. Click Proceed anyway and you should be able to access the Ranger Admin UI over HTTPS.